Traditionally, enterprise applications were built using a client-server approach. As web browsers became more widespread, many application developers preferred to provide a “web interface” as it allowed for transparent deployment of new functionality. This lead to the growth of web applications as we know them today. The unfortunate side effect of web applications is that web browsers were only ever designed to display static content. This has meant that designing an application to run within a web browser has been a non trivial task and has often lead to applications which are not as responsive or interactive as would have been the case with a rich client version. Thus, whilst web applications provide ease of deployment, they often decrease developer productivity and the overall ease of use of the UI is compromised. Recognizing the constraints of web browsers, there has been a recent trend towards Rich Internet Applications (RIAs) which aim to harness the ease of deployment of web applications and the rich user experience provided by traditional rich client applications. RIA technology is multi faceted and extends from AJAX applications which “extend” the usefulness of traditional browsers by allowing asynchronous communications (and hence reducing whole page refreshes) to more complex solutions such as Flex / Laszlo which use the Macromedia Flash environment included with most browsers to render the UI. A “universal” client which can run anywhere (in a browser, on the desktop) and can be used to render applications written in UIDL. This means that there is no need to worry about deployment or software upgrades. Mechanisms for providing easy access to server based resources. Ideally, applications can be modified to run with a UIDL interface without extensive additions and without modifying the underlying code. In many cases an application API can be exposed to transparently allow “remoting”. The main distribution site for UIDL releases is Google code, at http://code.google.com/p/uidl/downloads/list. The SVN repository for the UIDL source code is hosted by Google code at http://code.google.com/p/uidl/source. The UIDL distribution comes with pre-built UIDL JARs and all supporting JARs. Most of the files in the distribution are not for the UIDL browser itself but rather for the supporting examples (which require things like Spring and Hibernate). The source files for the UIDL browser are located in the /src directory whilst the source files for the example scenarios are are located in the /examples directory. Ant build scripts are provided for both the browser and the examples and are located in the /build directory. The /lib directory contains all the Java libraries required to build either the browser or the example applications. Run time JARs to support the example applications are located in /webapp/WEB-INF/lib. The /webapp directory contains all the server side code required for the example applications and is also used to server the initial files for the UIDL browser and the subsequent UIDL pages. 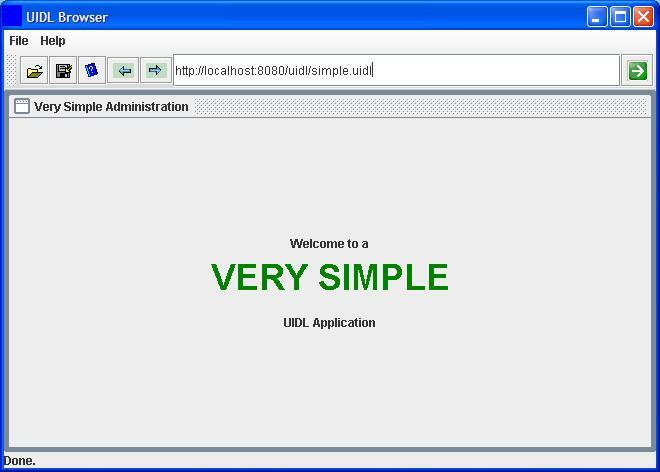 To illustrate how simple it is to run a very simple (static) UIDL application, you can simply copy the contents of the /webapp directory to a normal web server. From there you can navigate to the index page (index.html) and run either the Java WebStart or Applet version of the UIDL browser. Once running the browser, you can run any of the static UIDL examples (i.e. those which don't use remoting). These include ”simple.uidl” and ”converter.uidl”. You can simply run ”webserver.bat” or ”webserver.sh” from the root directory. This will used an embedded version of the Jetty web application server to publish the contents of the “webapp” sub-directory. After running Jetty, point your browser to http://localhost:8080/uidl/ and run either the applet or Java WebStart UIDL browser from there. You can simply build the UIDL WAR file and deploy it to your web server as you would any other WAR file. Building the WAR file is described in the next section. The default URI (jdbc:derby:carsales;create=true) will create a database in the root directory where you run the application from. Alternatively you can specify a fixed path as follows: jdbc:derby:C:/cep/uidl/db/carsales;create=true. Failure to complete this configuration will mean that whenever the web application is restarted it will be recreated and repopulated with the default content. If you intend to modify or recompile the UIDL browser code, you will need to be able to build the uidl.jar file. Note that it is very important to sign all the JAR files which will be loaded when the browser is run as an applet or as a Java Web Start application. This is typically just uidl.jar and js.jar (Rhino). If you wish to distribute the UIDL browser (or a UIDL application) in a production environment then it is advisable to sign all the required JAR files using a proper digital certificate issued from a trusted certificate authority. The build script (build.xml) can be modified with the appropriate certificate information if required. Typically you will compile a new browser by using ”ant signedjar”. This will produce a new UIDL browser library (uidl.jar) in the webapp/browser directory. In this way, the browser (either running as a Java WebStart application or as an applet) will pick up the new JAR file the next time it runs. The default target (jar) will produce a new JAR file with the class files for the examples in the /webapp/WEB-INF/lib directory. Depending on how you have configured your web application server, you may need to use the “war” target and redeploy the WAR archive (containing the new examples JAR) to your application server. To make use of a UIDL based application, end users must run a UIDL “browser”. This is analogous to a web browser except that it interprets and renders the UIDL language rather than HTML (actually it has limited support for HTML rendering as well). It could also be considered as a “universal client” for rich internet applications. The size of the browser / universal client is quite small (500Kb - 1Mb depending on remoting options) and it only needs to be downloaded once irrespective of the number of UIDL applications with which it is used. Being Java based, the browser will run on any OS which supports a recent Java Virtual Machine. Stand alone mode. Typically used by developers, where all Java libraries are statically located on the client machine. Java Web Start mode. This mode makes use of the Java Web Start technology introduced in recent versions of the Sun JRE. Users simply need to click once on the JNLP file describing the UIDL browser and it will be installed on their machine. In addition, if updates to the browser are ever required, these will be transparently loaded by the client each time they run the browser. Applet mode. For the most transparent deployment, the UIDL browser can be embedded within a standard web browser as a Java applet. Being a signed applet, it will only need to download the constituent libraries once and will cache them locally on the client machine. This means that the page containing the applet will always load quickly. Updates to the browser code will be delivered transparently to clients running in this mode. The UIDL Browser looks similar to the following picture when run as a Java Web Start application. This mode of deployment is recommended for environments where the user will only be accessing a single UIDL based application (and therefore doesn't need the navigation capabilities) or when the UIDL browser is run as an applet and the users may confuse the HTML browser's navigation bar with that of the UIDL browser. This mode of deployment can be thought of as “embedding” the UIDL browser into the UIDL application. Loading libraries from within the JNLP descriptor has the advantage of caching the JAR file and eliminates some security issues when using signed JAR files, although it is advised to load libraries from within scripts wherever possible to place the maximum amount of logic within the script itself and reduce external dependencies. Loading libraries from within applet code has the advantage of caching the JAR file and eliminates some security issues when using signed JAR files, although it is advised to load libraries from within scripts wherever possible to place the maximum amount of logic within the script itself and reduce external dependencies. More information about Rhino can be found at here. Just as a typical web browser provides applications with a set of core objects (such as window, history, etc) the UIDL browser provides hosted applications with a set of standard objects and functions. In addition to these “core” objects, any standard library can be used, provided it is made available to the browsers JVM. frame: an empty JInternalFrame in which the application can use to construct its UI. A more complex currency converter application (albeit slightly out of date) is shown below. Note that in a real version, remoting would be used to perform the currency conversion on the server, thereby using the most up to date exchange rates. Writing rich GUI client applications wouldn't be extremely useful if they had no way of communicating with a server for dynamic data updates. In a traditional web application, when new data is required, a new HTML page is generated from the server with the relevant information. This model is both slow for the user and cumbersome for the developer. Using this principle, remote user interfaces can be developed extremely easily for server applications as the existing server side objects can be transparently made available to clients with little or no modification to existing code. UIDL formally supported two forms of remoting: JSON-RPC and Spring remoting. Due to enhancements made to the JSON-RPC support (automatic proxy creation from server supplied meta-data) Spring support is now depreciated. The advantage of using this protocol with UIDL is that it is extremely flexible: no Java class libraries need to be transmitted to the client to support the corresponding implementations which reside on the server (as would be needed with alternative protocols such as RMI). This allows client memory footprints to remain small and allows UIDL scripts to be relatively robust to changes in server side objects (code will only break if method signatures change dramatically). The UIDL browser will require access to any complex Java types which are returned from any of the exposed server side objects. These are exposed in the remoteClasses.jar library. Note that you obviously must know the names of the objects exported by the server. The only requirement for this approach is that the UIDL browser must have access to the class files representing any serialized objects (e.g. User) returned from the server. Note that access to exposed service class files or interfaces is no longer required. This requires some coordination as we need to ensure that whenever these files are modified on the server, we make the corresponding remote interfaces (a sub-set of the server files) available to the client. See the remoteClassJar target in the build section for one way of doing this efficiently. There is a one to one correspondence between the Java objects and their respective tables. All relationships are managed using EJB 3 persistence annotations and the entire database schema can be regenerated at any time directly from the object model. The association tables (e.g. 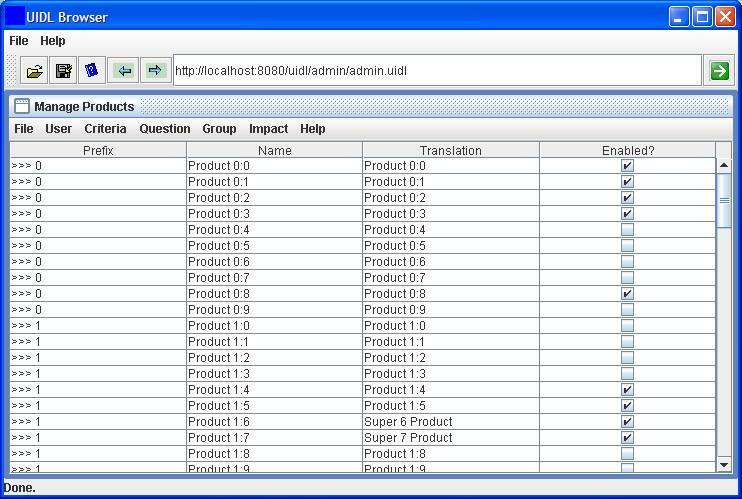 customer_make) are generated automatically and are required for N:N mappings. Obviously these tables don't directly map to any Java objects. To run the CarSales application, first ensure that your database is configured correctly and then simply point your UIDL browser at the CarSales example URL (e.g. http://localhost:8080/uidl/carsales/carsales.uidl). The CarSales examples allows of use of either Spring remoting or JSON-RPC as a transport layer. The example also reveals how transparently the remoting implementation can be switched. The UIDL source code for the application is located under ”/webapp/carsales”. The Java code for the server side is located under ”/examples/net/uidl/carsales/”. 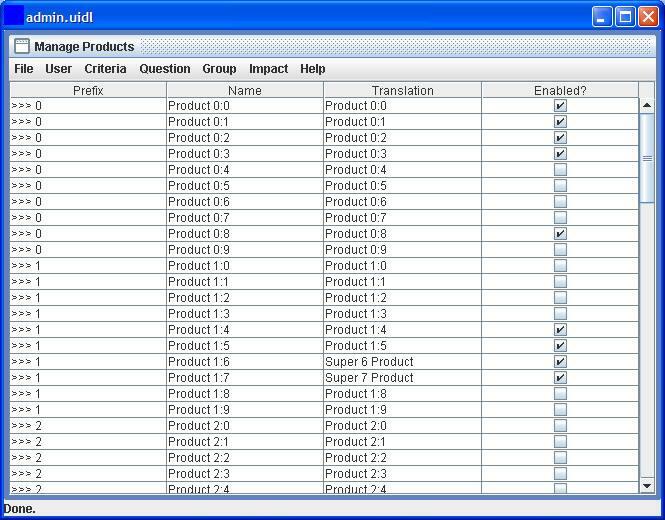 Basically, the CarSales application allows you to add as many makes as you like (e.g. Alfa, Fiat, Ferrari). You can then add models to these makes (MAKE_MODEL association) In a similar way, you can create customers and associate make preferences with each customer. You can also create options (heated seats, metallic paint, etc.) and associate these with wither the make or the model. All data is persisted in real time in the Derby embedded database on the server. Most enterprise class applications will require some form of security, including the possibility to recognize and authenticate users and assign appropriate roles. Rather than forcing application developers to implement custom solutions to satisfy these requirements, the UIDL environment aims to make it as easy as possible to implement security in UIDL applications. Given that the UIDL browser uses HTTP to transport UIDL scripts and HTTP for all remoting operations (unless a custom remote object mechanism is used), one can make use of existing HTTP security standards such as HTTPS and realm based authentication. Specifically, the following code within the web descriptor (web.xml) of the UIDL web application is sufficient to protect not only the downloading of the UIDL scripts but also any method calls which might be issued from a script. Finer grained security can obviously be implemented if required. The UIDL browser (running in either applet or Java Web Start mode) will use a dialog box to prompt the user for credentials the first time he accesses a protected resource. Note that the realm will need to be configured on the web server / web application server in order for this type of security to function. Typically a realm is linked to an LDAP directory containing user information.